Recently I have been doing some work for a couple of local clients who were almost at their wits end. They had sites up and running however there were major issues, whether it be security fixes that were not updated properly, site performance issues or outdated code. They had been sold on a solution, which initially looked very good and worked well. The initial pricing was reasonable and the launch went fairly smooth. For months they paid for their hosting and updates as required. But then something changed. After a while they were not getting responses to their queries within a reasonable period of time, if ever. The responses when they did come were inadequate, and seemed “pre-packaged”. The support person did not understand their business or what they were trying to accomplish online. In some cases the clients were being charged for fixes and updates that should have been automatic as part of their expected levels of service. In short the company they were trusting with their online presence was more vested in their continued payments and less vested in their longer term success. There’s little doubt that web hosting (and design for that matter) has become a commodity and as consumers we can shop that commodity from any trusted supplier on the globe. However, where things tend to break down is on support. 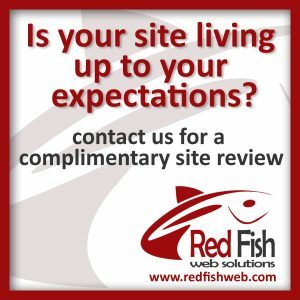 Here at Red Fish we host on a global platform but we offer our clients a local level of support. We take the time to understand our clients business and what their expectations are in terms of service. We respond to emails and phone calls promptly and we don’t drop issues until the clients are satisfied they are resolved. We prioritize maintaining existing client relationships over the pursuit of new business. We are vested in our local community and are actively involved in making it better. We want to see local businesses succeed, not just locally but in whatever markets they wish to play in. Now, I have nothing against outsourcing as a concept, but does a person overseas answering the phone eight time zones away really understand your concerns and what it is you are trying to accomplish? Are they truly vested in your success? Is it realistic to expect a high level of service when you are paying only a few dollars a month? Using another example; when you buy a car, no matter the company that car is assembled from parts that are sourced around the globe. A Chevy might have parts from the same place as a Honda or Volvo for example. Today’s automobile is a product of competitive global sourcing. But, when the car needs service, do you call GM headquarters in Michigan or Honda headquarters in Japan? No, you deal with your local dealer for service. They are tied to the global brand but they also have a strong local presence and are vested in your satisfaction with the brand and their level of service, or at least they should be. 1) A dedicated standalone server as we have had for the last few years. Highly reliable, good service but not easily scalable and quite pricey. 2) A “VPS” system. VPS stands for Virtual Private Server and is basically like a server timeshare. You are allocated a portion of one servers resources to use for your needs. There are many choices here and as a result the pricing is very competitive. In most cases they can be scaled up or down as needed and allow for more or less the same level of control as with a dedicated solution. Some even come with solid state drives for fast response times and good reliability. 3) Move to a cloud-based solution. Computing in the cloud is like VPS on a massive scale. Rather than sharing the resources of one physical machine your resource sharing is potentially spread across an entire network of servers. The cloud uses sophisticated traffic management and routing software to optimize the allocation of computing resources. You may end up with several smaller sites on one virtual machine, a large site on its own and all of the long term storage and file backups on a storage service. All of these can talk to each other through one control panel and the use of security protocol between them. There are several large players in this space and for a while it was dominated by Amazon. But recently Google has entered this arena, and Google does not do anything on a small scale. So as you may have gathered I have chosen option 3. Why? Well after a lot of research I have come to the realization that this is the best solution for the future. Computing is going this way, big time. Just the other day Bill Gates, when asked where computing was going in the next 10-15 years mentioned that one of the biggest trends will be the separation of devices and data. Many more devices will operate anytime, anywhere using data from the cloud. Its not too hard to imagine a world in the near future where we can travel anywhere anytime with almost any device and access any or all of our data pulled down securely and seamlessly from the cloud. So far I can only see one downside to this and for me that is learning curve. Moving to the cloud requires learning some new tools and re-familiarizing myself with some old ones (Linux). Its been a real journey over the last month or so, not short of moments of frustration, but now most of the sites in our network are moved over and running beautifully. I’m pulling my head out of the clouds and so far I like what I see. The biggest advantage of all however is yet to come. Operating in the cloud with secure, instant access to a limitless amount of data will offer a real advantage to our clients in the future. Think easy backups of critical data, integrating back end data with the website and access to a whole world of apps that can perform any manner of function. So stay tuned, I’ll be talking more about the cloud in the months ahead. Have you seen the emails? “Guaranteed first page on Google® in one week”, “SEO Expert, free consultation”, “Secret of Search Engine Rankings revealed”, or variation of these themes. There are thousands of companies and/or individuals around the world that are basically taking advantage of the fact that the average person does not really understand, nor need to, understand all the facts about Search Engine Optimization (SEO) on their website and so by making claims of some sort of “silver bullet” to achieve search engine glory they play upon people desire to be successful, its not a lot different than those that pump up stocks, or, to be a little more brutal, the “snake oil salesmen” of old. I am not saying they are all like that but, sadly, many of them are. Before getting into the details of why most of these claims won’t work, lets take a step back and examine what is really meant by Search Engine Optimization. First off, a common misunderstanding is that paid advertising is the same as SEO. It’s not. Paid advertising will get you listed in search results even if your site is not search optimized at all. The position of your listing and the frequency by which it is shown will depend on how much you are willing to pay every time someone clicks on your ad. This is referred to as the pay-per-click rate or abbreviated as PPC. True Search Engine Optimization deals with things you can do to your website to help it achieve good search result placement (preferably on the first page of results) without having to pay on a per click basis. Normally this has to do with things like; the quality of content on your site, the positioning of specific keywords to help the search engines identify what you are about, adding specific types of tags in the right places, simple straight forward navigation and the number of pages that link to your page. There are many more things the search engines look for, but those are some of the more common things. Over the years Google® and other search providers have refined the ways they index and rank websites and they will continue to do so in the future. That means achieving good search engine rankings is not a one-time event, it requires ongoing “tweaks” to the site to make sure it stays current with the latest ranking logic. Just as the search providers continue to make improvements, there is an army of programmers out there who seek to figure out ways to circumvent their logic, in other words figure out ways to cheat the search engines in order to achieve ranking. Over the years the search providers have figured out most of these so-called “black hat” techniques and have put in place ways to penalize those sites that employ them. But the black-hatters are always looking to be one step ahead, and for a while it might work, and then one day, boom, the rankings are gone and the site that had employed those techniques descends into search ranking purgatory. That’s why these instant gratification strategies seldom work for long. There’s another major problem as well. In order to effectively optimize your site a SEO expert will have to have full access to the code on your site. There are at least two problems with this. First, they could potentially place stuff in your code you really don’t want, or in a worst case scenario could compromise the security of your site. Secondly, most web developers don’t appreciate giving up their original code to others who they don’t know. Its like asking a famous songwriter or artist to give away all their secrets. Be very careful about who you are giving access to your site and be sure you understand just what they intend to do. OK, so now that I’ve probably raised some alarms about what not to do, lets talk about some things we can do to optimize your site effectively, and legitimately for the long term. First off, lets try to get a basic understanding of how exactly a search engine gets information from your site. The key to understanding what a search engine does is by realizing that at its core it follows links, as pages link to other pages the search engine “spider” or “web-bot” crawls along those threads created by the links between pages and sites and makes notes of the interesting things it finds along the way. It also looks at how many other places link to a specific page. It then deduces that the more incoming links are found for a specific page the more popular it must be, and therefore starts to assign a level of importance to that page. The next thing it looks at is what the page itself contains. This is where it can get interesting. Another important thing to understand is that (web) spiders are primarily interested in textual content. While they can acknowledge that other types of content (images, videos, flash, etc) exists they can’t effectively interpret what it is without some “helper” text to describe what they are looking at. Spiders also have complex logic when it comes to determining which text on a page best describes what the page is all about. This goes back to my earlier comment about effective keywords and positioning that in the right place on a page. Over time spiders have gotten much better at interpreting our languages and just what it is we are trying to say. As I said initially, they have also gotten much better at figuring out the little tricks that us humans like to play. As the web spiders are out gathering information they are sending it all back to home base, which in this case is one or more massive data centers operated by the search providers. All this data is compiled, compared, analyzed and ranked and then eventually passed to all the other connected data centers that provide search services. Some people have this vision that Google® is this massive complex that houses thousands of computers, and it is, but those computers are spread out throughout various parts of the world. helping providing speed of delivery and redundancy. At any given time its highly likely that many of them are not completely in sync, as different datacentres are being updated at different times. Ever wondered why one day you search for a topic and get one set of results and the next day you may get a different set? Chances are you are being directed to a different datacentre, based on overall system load. Admittedly this is a highly simplified view as to how spiders and their accompanying datacentres work. The actual details of how many of the final determinations are made are closely guarded by the search providers, but hopefully that has given you some idea of how the process works at a high level. The only way to understand how to improve one’s own results is to understand the method and criteria by which they are being assessed. As you may also be starting to see, this is not a process that will necessarily happen quickly, especially on sites that are more complex with lots of pages. We typically see changes in ranking after periods of time ranging from several weeks to several months and recently these times are improving. It used to take much longer. You can start to see however how claims of “top ranking in 24 hours”, etc are just not realistic, unless of course you are willing to pay for placement (online ads). After having a better understanding of how SEO works, its time to take the next steps in place. First, we can help you come up with a customized SEO strategy based on your site and your goals as a business. Secondly we implement those elements as part of the web design (or re-design). Thirdly we measure and monitor results to see if things are moving forward in the right direction. Where things need to be tweaked those tweaks are put in place. As you can see it’s not a one time event, its an ongoing process of continual monitoring and updating as conditions and the whims of the search providers change. There are always ebbs and flows as conditions change, and as I’ve mentioned before sometimes the search engines can be a bit temperamental. It’s a bit like steering a large ship, you can’t make major course changes every time the sea conditions change, you have to anticipate ahead and make small incremental changes to get back on track. We couldn’t agree more, but that doesn’t mean you shouldn’t consider setting up a storefront in the digital online world in addition to the traditional offline storefront, commonly referred to as the “bricks and mortar” world. The thing to keep in mind is this – e-commerce (the marketing and selling of products or services on the World Wide Web) is not just about selling, its also about visibility, branding, building trust, pre-qualifying customers and having your customers pre-qualify you (more about each of these to follow). But how is this possible when so many websites seem so cold, so cluttered or so impersonal? The answer to this question is, simply, so don’t build a website that is cold, cluttered or impersonal. Build a website that is user-friendly, easy to navigate, chock full of valuable information and most of all – engaging the customer to want to find out more about your business. Even if you don’t list a single product on your site, at a minimum you want to at least have your business be found and provide at least some information about what you do, who you are and where to find you. Recently an important milestone was reached, as the total value of online advertising in the United States surpassed the value of print based advertising. This tells us that the majority of advertisers, large and small, now feel that it’s more important to reach their target clients online than through the more traditional print based methods, newspapers, magazines and the like. The current and up and coming generation of consumers, both personal and business based, no longer use phone books. The go-to location for finding a business is now Google, followed by some of the lesser known search engines. I don’t know about you, but my phone books generally go from the mailbox, to a shelf in my office and then to a recycle bin about a year later, with very little page wear I might add. I’ll cover Search Engine Optimization (SEO) in at least one other article, but suffice it to say that having a site built from the ground up with SEO in mind is the key to effectively getting your website, and hence your business, visible to the customers you are trying to target. You’ve probably already heard about the importance of a consistent, easily recognizable brand. You use branded products every day and, if you are like me, you may sometimes feel bombarded by brand based marketing. I’m not going to get into details about why branding is important, you probably know that already, but in the context of extending your business presence onto the web, suffice it to say that the importance of consistent branding goes up a few notches, and extends from the offline world to the online one. The look and feel of your online presence should complement and sync with the look and feel of your offline presence. If you are an auto repair shop, you probably don’t want your website to be filled with swirly fonts, artistic graphics and quotes from modern poets, unless of course your logo, décor and storefront match that image. More likely you want it to look clean, sturdy, rugged and friendly. Ideally you want a customer, after finding you online and driving to your offline location, to immediately know they have arrived at your actual business, because it closely resembles what they have seen online. If your business talks about being customer centric, casual and friendly, that impression should be realized once a customer walks in the door. To emphasize the point, you should not think about branding in terms of two worlds. Your online branding and offline branding should complement, mirror and flow into each other. We live in a skeptical world where consumers of products and services become more cautious, savvy and demanding with every passing year. Its no wonder! In todays hyper-targetted environment, we are subject to a constant barrage of get-rich quick schemes, “too good to be true” offers and bait and switch games that ultimately end with broken promises and a loss of trust, or worse…Your website should be a way to instill trust in your customers, to help them feel comfortable about giving you some of their hard earned money. How do you do this? There are many ways and I won’t go over them all in detail here, but some of the more effective ways are; telling the client about your company in a way that is open, friendly and perhaps even fun, offering real testimonials and reviews from other customers, being clear and upfront about your policies regarding payment, warranty, refunds and exchanges, etc and offering a selection of ways to speak to you, ask questions and give feedback, whether it be by phone, email, social media or online chat. Heres the good news.. none of these things are really difficult to do, if you spend a little bit of time planning it out. They don’t call it the World Wide Web for nothing. It’s a web, and an enormous one at that. To use a fishing analogy (we like those) – when you cast a big net you sometimes catch a lot more than what you are looking for. It’s the same with the world wide web, and that’s why it is absolutely critical to be very selective about how you word your website and how you structure those words. You want to, as closely as possible position your website so that it is seen by the people you want to see it. The major search engines have made incredible strides in recent years in terms of doing a better job of showing more relevant results, both in searches and in paid advertising. The trick is in knowing how to put in place the things that the search engines want to see. That’s the first part. The second part is – once the visitor lands on your page, how do you ensure that you are providing them the right kind of information to make sure that a) they have enough information to want to pursue it further and b) they are within your target customer base. That’s the pre-qualifying part. This may sound a bit alarming, but bear with me for a moment. This article deals with the premise that e-commerce is not just about selling online. So what if you can increase sales at your offline location with or without selling online? That’s what an effective product or services based website can do. It’s incredibly difficult to measure, but there is strong evidence to support the belief many traditional sales are secured before the customer even walks in the door. According to a recent Search Engine results Page Insights study, 76 percent of people online gather information a product online before ordering from a store or catalogue. Providing the salesperson doesn’t say something inappropriate or there is some other event that causes the buyer to change their mind, they are going to buy an item. Why? Because they have already done their homework and have enough information to feel comfortable about liberating some cash from their wallets. The savvy shopper has read the product information, specs, reviews from other customers and compared prices online before they stepped foot in the store. Some even do that while they are in the store (think barcode scanner on a smartphone, yes it is happening!). This is why geographic targeting in addition to the steps mentioned above are critical. So, if all this is true, why even bother selling online? If you are thinking along the lines of expanding your markets and offering the convenience of delivering to the doorstep, you are on the right page. If your interest is mostly in promoting your business locally, online selling may not be a necessity, but an effective online presence….is. Love it, hate it, or just can’t get enough of it, social media looks to be fast becoming an ingrained part of our culture. It has changed the way we communicate as a modern society in ways that we really can’t appreciate until we think back to the days before Facebook®, Twitter®, LinkedIn®, etc. I have to admit, I was not an early adopter and at first I was not an enthusiastic convert. Some days I still curse it, but for some strange reason however I find myself inexplicably drawn to my Facebook pages at least once every 3-4 hours. Note that I said pages, not page. That’s because I have several that I update. I have my personal page of course for friends, family, colleagues, I have my business fan pages (two) and I have several other fan pages which I am listed as ‘admin’, meaning that I can post and moderate on those pages as well. I only started a Twitter account in the last month. I just don’t feel that my life is interesting enough that I need to tell people what I am doing every hour of the day. Having said that, I understand the value of it for certain people and I completely understand the addictive nature of it. I am always amused to hear celebrities and news personalities comparing how many followers they have as if it is some sort of popularity contest, and, as recent world events have proven, the ability to broadcast almost instantaneous updates to legions of followers is an incredibly powerful thing. I joined LinkedIn about two years ago and I have been slowly expanding my network ever since. Clearly LinkedIn has done a good job of positioning itself as the professional network for business contacts, job and contract leads, etc. Of the remining major social media players I have to admit that I quite like Pinterest. While I am not yet subscribed I know a lot of people have been posting my pictures there. While at first I was angry at this, how can people just use my pictures without asking, after looking into it in more detail I found that Pinterest handles it fairly, always linking back to the source of the image. Not only does this give me more exposure, it also helps my site SEO. The more links coming into a site the better. So in this article I am not going to get into the specifics of what to do on Facebook vs. Twitter vs. the “flavour of the month” or the pluses and minuses of each but discuss in more general terms how to (and how not to) use these tools to increase customer loyalty. Here’s the most important thing to remember – its all about the relationship you are building, its not about sell, sell, sell. Lets look at a short case study on how not to do it. Bob’s Gadget Company (BGC) is in the business of selling gadgets. They sell about half of their gadgets from two stores in shopping malls and the other half through online sales to people who, in general, must always have the “latest gadget”. Lately, Bob (the owner) has been finding that people are coming into hist store with much more knowledge of his gadgets. They don’t have as many questions and they have already made their decision as to which of his gadgets is the best one for them. Thats great for Bob as it frees up staff time to do other things like making nice displays and adjusting prices. Recently Bob introduced a new and improved version of one of his gadgets, called “Edge”. Edge was an experimental product that packaged his gadget into a lower profile case and had a “higher resolution super-multi function display”. As a small player in the gadget market Bob had done very little advertising on this new product and was currently only producing Edge in limited numbers. He was spending far more time and money promoting his established and time proven gadget, called “Shark”. Shark had been a consistent best seller for the last two years and BGC had lots of inventory on hand that needed to be sold. Bob soon noticed an interesting and somewhat unexpected trend. Almost every person coming into the store was asking for Edge. His online sales for Shark were down and his webmaster was reporting that there were thousands of searched for Edge even though it was not even available online yet. Bob had been caught in the social media tsunami.